The ability to make waffles which are cooked evenly on both sides means the difference between perfect waffles and waffles which are half crispy, and half soggy because some batter is uncooked. The other issue can be waffles where the color across the surface is light in some parts and dark in others. The solution to these problems is to use a rotating waffle maker which turns 180 degrees, so batter is spread evenly when cooking. Our review looks at three top rotating waffle makers, and determines which one is the best. 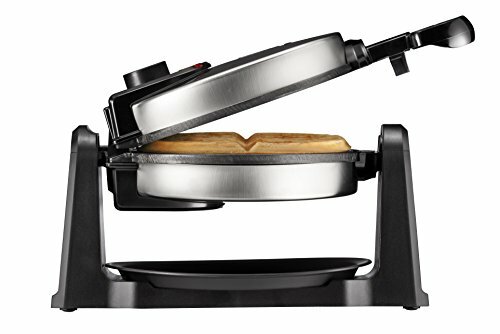 Cuisinart has a very good reputation for producing top quality kitchen products and their WAF-F10 rotating waffle maker enhances that reputation. It is a high-quality waffle maker with some great features to make cooking waffles as easy as can be. One issue that many waffle makers have, especially rotating waffle makers which must heat both cooking plates, is a lack of power to create sufficient heat. This means it takes longer to heat up, and longer to cook the waffles. This should not be a problem for this Cuisinart rotating waffle maker thanks to its impressive 1000-watt output which will produce more than enough heat, and do it quickly too. Once the waffle maker has reached a sufficient temperature to start cooking waffles, a blue LED indicator light comes on to let you know it is ready. Next to the indicator LEDs, you will see the temperature control dial. This has six individual settings and is a great feature which enables you to set the waffle maker to cook your waffles exactly the way you, your family or your guests prefer them. To cook your waffles, you obviously need to have your batter mixed, and once the waffle maker is up to temperature you can pour the batter into the base plate. Set the temperature control too low for light colored and softer waffles, and use a higher setting if the waffles are to be darker and have a crispier texture. Another thing we love about this rotating waffle maker is how deep the plates are. This will produce nice thick Belgium-style waffles which are perfect for breakfast, a snack or as a dessert when filled with fruit or whipped cream. During the cooking process, you should rotate the plates 180 degrees, so the batter is evenly spread within them, and your waffles are being cooked evenly throughout. If any batter should happen to spill at this point, there is a stainless-steel drip tray underneath to prevent it making a mess on the counter. When your waffles are ready another blue LED light will come on to let you know it is time to serve them. When you open the waffle maker up, thanks to the non-stick coating on the cooking plates, your waffles should come away easily with no need for you to scrape it off with knives or spoons. Cleaning up afterwards is simple too, and everything should need no more than a wipe with a damp cloth. This a neat and compact rotating waffle maker that will cook your waffles evenly throughout. To use it is as simple as can be, and it is also great value for money, thanks to its competitive pricing. Whether you are someone who hates complicated appliances or someone who just wants a rotating waffle maker that gets on with cooking them without a load of bells and whistles, you will be delighted by how simple the Toastmaster Low-Profile Rotating Waffle Maker is to use. It is hard to think how much easier the manufacturer could make this appliance without removing the electrical cord. Yes, that does mean you need to plug it in and switch it on, but we’re sure you don’t mind that. Once you have done so, wait for a few minutes until you see the indicator light on the top plate. This means the waffle maker is ready to cook. You will see that the cooking plates have reasonable deep channels, so you will need to judge how much batter you’ll need so that you have enough for complete waffles. The danger if you do not use enough batter is that your waffles will be very thin. The batter is evenly distributed thanks to the rotation feature, which you operate as the waffles are cooking. When you rotate the plates using the handle on the side, it means any areas inside where the batter has not reached are filled. The plates are circular in shape, so the waffles cooked can be one large round waffle, two semi-circles, or four quarters depending on how many people you are cooking for, and which way you choose to divide the waffle up. With some rotating waffle makers there is sometimes a problem with batter leaking as the plates are turned. The plates on this waffle maker have a locking clasp which should minimize this problem. However, even if some batter does leak, it will be caught underneath in the drip tray, and thus stop your countertop getting covered in batter. The drip tray can be rinsed with water to clean it. Unfortunately, the cooking plates are not removable, so the only way to clean them is with a damp cloth, however, the fact that they are non-stick should mean that there won’t be too many issues removing any stubborn pieces of batter or waffle. The last thing to say about the Toastmaster rotating waffle maker is its very low price which makes it a great value for money purchase. This is a compact stainless-steel waffle maker that comes with more features than its small size might suggest. It’s very easy to use, allows you to control the cooking level, and can be cleaned up in seconds. Although smaller waffles makers are not always the prettiest, we are impressed with the styling of this rotating waffle maker. The combination of black trimming compliments the stainless-steel body well, to produce a waffle maker that looks great. In terms of its features, you will first see that it has a wrap-around cord compartment so whenever it’s stored, it will take up less space. Once you switch the waffle maker on, a red indicator light will come on. This is important as it lets anyone know that the exterior metal of the cooking plates could be very hot to the touch. With the waffle maker up to cooking temperature, open it and pour in your waffle batter. Once you have done so, you can now select how dark or light you want your waffles to be using the control dial on the top plate. It is a relatively basic control with the minimum and maximum settings being ‘Light’ and ‘Dark’ respectively. There are no other levels marked so it is simply a case of moving the dial one direction or the other to the level you think is right for you. As your waffles cook, it is now time to rotate the plates so that the batter is distributed evenly throughout them. As you do so, any batter which overflows as you are turning the plates should be caught underneath by the drip tray. The handle can be locked into position so that the plates do not move when not required to. The position you set the browning dial will determine how long the waffle maker cooks for, and when that time is up, the green light on top will come on to let you know your waffles are ready. Cleaning up afterwards requires no more than water and a cloth thanks to the non-stick coating on the cooking plates. The drip tray can also be rinsed with water to clean it. 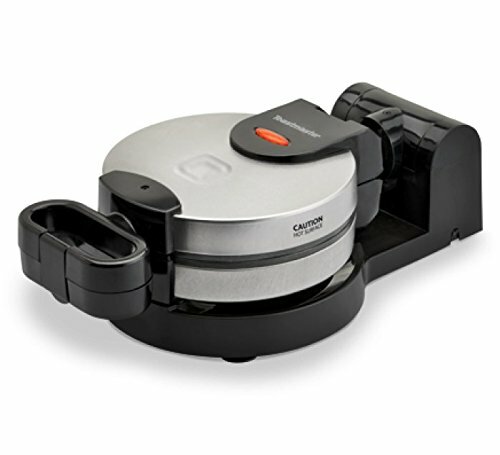 One nice extra that comes with this rotating waffle maker is you are given access to ‘Club Chefman’ which is the manufacturer’s resource center for cookbooks, videos and recipe ideas. PERFECT BELGIAN WAFFLES: Extra thick non-stick waffle plates will help you easily remove your waffles without damaging them to create deliciously perfect restaurant-style waffles every time; allowing you to take on even more fruit, ice cream, syrup and endless delicious toppings. 180 DEGREE ROTATING DESIGN: The Rotating Waffle Maker's convenient flip system spreads batter evenly to allow the batter to fully coat the waffle iron cooking plates, which is important for evenly cooked Belgium waffles. To create light and fluffy waffles or waffles with a crispier texture, simply adjust the temperature. ADJUSTABLE TIMER: Adjustable browning control dial gives you flexibility to create waffles just as you like them. Set the timer to a lower setting for more light and fluffy waffles and a higher setting for a darker, golden, crispier waffle. EASY CLEAN AND SPACE SAVING: When finished, the drip tray removes easily for quick cleanup. Just wash with a mild dishwashing soap and rinse with warm water. The appliance can be stored vertically to help save counter or cabinet space. RESOURCES AND WARRANTY: Includes access to club Chefman for Tailor made step-by-step recipes, tutorial videos, and more! cetl approved with advanced safety technology for long lasting durability, 30 day Money-back Guarantee, & 1-year Hassle-Free warranty provided by Chefman. 1080 Watts & compatible with 120 Volt outlets. 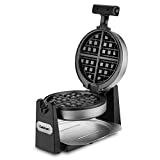 The category of best rotating waffle maker has seen us review three excellent products, and we have found it very difficult to select a #1, simply because each one of them is made to a very high standard. 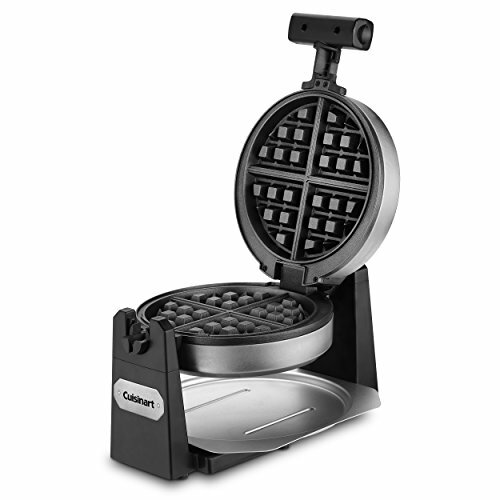 As always, we need to pick a winner, so our best rotating waffle maker is Cuisinart WAF-F10 Belgian Waffle Maker. It has some excellent features such as the deeper plates so that you can make thick Belgium waffles, plus we also love the fact that it has a browning dial to control how dark or light those waffles are. Indicator lights to alert you when they are ready are very welcome too. The main advantage this Cuisinart waffle maker had over the other two is its 1000-watt output which means it is ready to cook quicker, and then subsequently cooks your waffles in less time too.